Istio.io can control the routing of traffic between services, making it valuable for traffic control in applications with microservices. We've been talking about Istio and service mesh recently (follow along @christianposta for the latest) but one aspect of Istio can be glossed over. One of the most important aspects of Istio.io is its ability to control the routing of traffic between services. With this fine-grained control of application-level traffic, we can do interesting resilience things like routing around failures, routing to different availability zones when necessary etc. IMHO, more importantly, we can also control the flow of traffic for our deployments so we can reduce the risk of change to the system. With a services architecture, our goal is to increase our ability to go faster so we do things like implement microservices, automated testing pipelines, CI/CD etc. But what good is any of this if we have bottlenecks getting our code changes into production? Production is where we understand whether our changes have any positive impact on our KPIs, so we should reduce the bottlenecks of getting code into production. At the typical enterprise customers that I visit regularly (Financial services, Insurance, Retail, Energy, etc), risk is such a big part of the equation. Risk is used as a reason for why changes to production get blocked. A big part of this risk is a code "deployment" is all or nothing in these environments. What I mean is there is no separation of deployment and release. This is such a hugely important distinction. A deployment brings new code to production but it takes no production traffic. Once in the production environment, service teams are free to run smoke tests, integration tests, etc without impacting any users. A service team should feel free to deploy as frequently as it wishes. A release brings live traffic to a deployment but may require signoff from "the business stakeholders". Ideally, bringing traffic to a deployment can be done in a controlled manner to reduce risk. For example, we may want to bring internal-user traffic to the deployment first. Or we may want to bring a small fraction, say 1%, of traffic to the deployment. If any of these release rollout strategies (internal, non-paying, 1% traffic, etc) exhibit undesirable behavior (thus the need for strong observability) then we can rollback. Please go read the two-part series titled "Deploy != Release" from the good folks at Turbine.io labs for a deeper treatment of this topic. 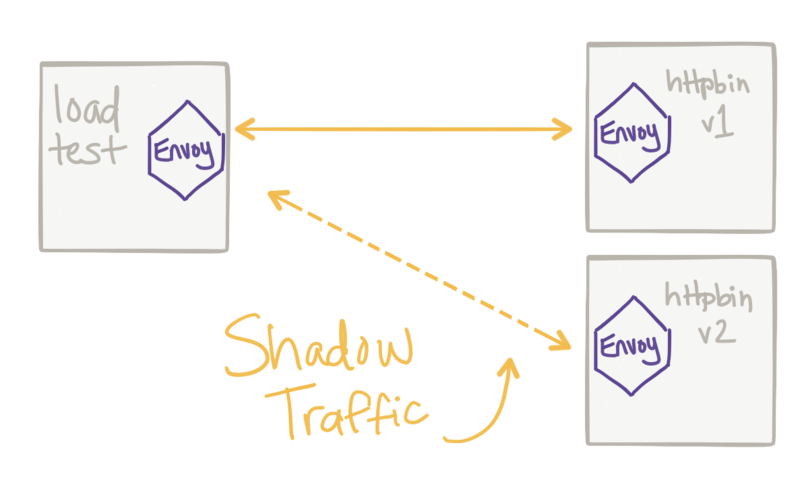 One strategy we can use to reduce risk for our releases, before we even expose to any type of user, is to shadow traffic live traffic to our deployment. With traffic shadowing, we can take a fraction of traffic and route it to our new deployment and observe how it behaves. We can do things like test for errors, exceptions, performance, and result parity. Projects such as Twitter Diffy can be used to do comparisons between different released versions and unreleased versions. With Istio, we can do this kind of traffic control by Mirroring traffic from one service to another. Let's take a look at an example. With the Istio 0.5.0 release, we have the ability to mirror traffic from one service to another, or from one version to a newer version. We'll start by creating two deployments of an httpbin service. 127.0.0.1 - - [07/Feb/2018:00:07:39 +0000] "GET /headers HTTP/1.1" 200 349 "-" "curl/7.35.0"
If we check the logs for the httpbin-v2 service, we should see NO access log statements. Now, if we start sending traffic in, we should see requests go to v1 and requests shadowed to v2. Istio Mirroring Demo from Christian Posta on Vimeo. Please see the official Istio docs for more details!